“Are you here for the Chilterns walk?” asked a pair women, somehow correctly guessing that the two people stood in front of them at Marleybone station were also walkers. Maybe the hiking boots and rucksacks gave the game away. “No, but they might be,” I replied, pointing to a group of similarly clad people who were also loitering in the station. Either the two women had already approached that group, or they’d decided that the group didn’t look like the kind of people they’d like to be associated with, as they politely thanked us and headed off in completely the opposite direction. They’d got something about us right though. We were off for a walk in the Chilterns. It just was highly unlikely that we’d be doing the same one. Ours would be no gentle day walk with a pub lunch and a stop for tea before heading back home. Oh no. We were to do something grander. A two day epic no less. For we were about to complete an 87 mile journey. 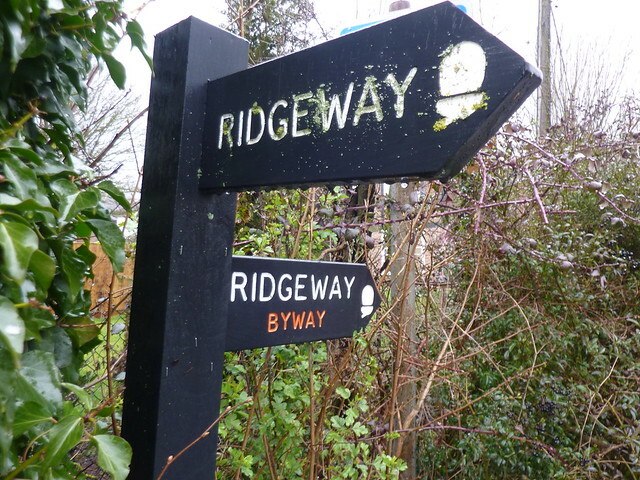 We were off to finish walking the Ridgeway. “When are we going to finish the Ridgeway then?” was a question that had sprung from Tal’s lips so many times that it seemed churlish to point out that when we did reach Ivinghoe Beacon, he’d still actually be some way from completing the trail as he would only have done the eastern half. Still, no one would argue with his enthusiasm, nor indeed anyone else’s, for reaching the finishing line. But despite the desire, there just never seemed to be the chance to do it. I’d walked the eastern half from Overton Hill to Streatley in March 2011 with my partner Catherine. 42 miles, mostly of (funnily enough) ridge walking through Wiltshire and in to Oxfordshire. The route took us along downsland, near remnants of ancient forts and castles, and past mysterious white horses carved in to the chalky hills. A few weeks later, in early April, we were back with four friends in tow to heard for two days of walking along the River Thames, then following old drovers roads and fields until we reached Princes Risborough, which is a town whose very name must surely vex all those that subscribe to the almighty power of the apostrophe. They’d been good trips; the spring weather fine, the sun shining brightly and the company more than acceptable. 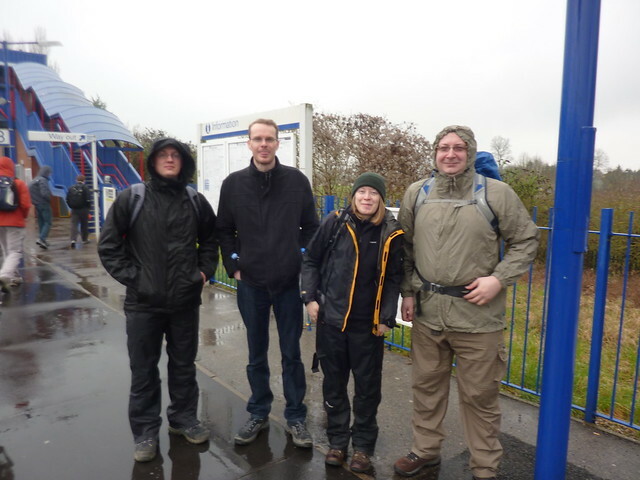 “We must do the rest” was a regular rallying cry, but circumstances conspired against us until, nearly a year on, we once more found ourselves stood on the platform of Princes Risborough station; this time eschewing sun tan lotion in favour of the almighty power of waterproof clothing. Well except for Tal who’d decided to travel so light that his few belongings were shoved in pockets; a plastic bottle of water sticking out lopsidedly from one of them. “Only supposed to be a light shower!” I exclaimed by way of consolation as the rain soaked through his jeans, but even a bit of poor weather couldn’t dampen the spirits as we headed off in search of the Ridgeway once more. 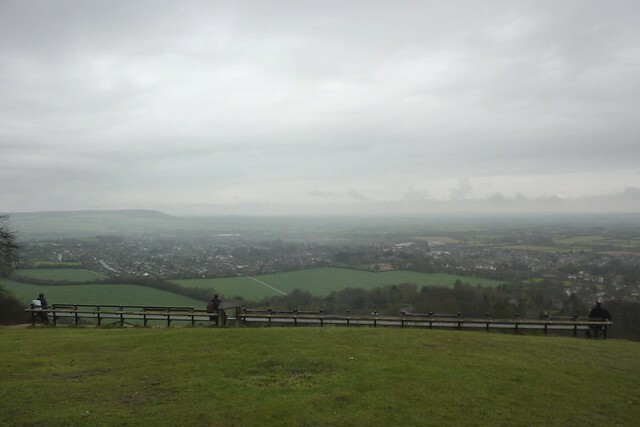 The rain soon eased off and a steep climb up Whitecliff Hill probably saw sweat make us wetter than the rain managed to. Whitecliff Hill was clearly a popular spot given the size of the bench at the top of it. Easily providing room for thirty people, the monstrously sized bench could probably have housed fifty people at once if everyone had budged up. On a sunny day it would no doubt be rammed full with locals all looking down on their home town. But with just the five of us up there, its size seemed like overkill. Leaving the view behind the Ridgeway headed off to a mixture of woods and downsland as it meandered on, almost as if it was struggling with the concept of leaving Princes Risborough behind. A group of Territorial Army members marched past, heading in the opposite direction and they were followed by a veritable squadron of pensioners, armed with walking sticks and rucksacks which were, no doubt, weighed down by large flasks of tea. 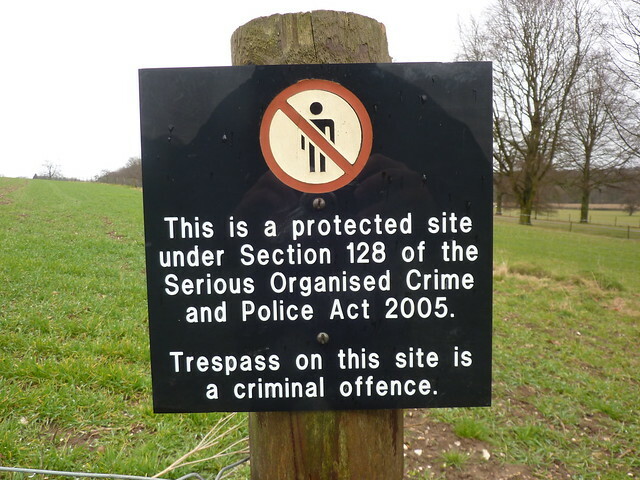 Then came perhaps one of the Ridgeway’s most surreal sections as signs attached to fences warned the walker that the field was protected under Section 128 of the Serious Organised Crime and Police Act of 2005. A gate led on to a driveway; huge CCTV cameras staring down at the small right of way that crossed it. Turn right down the driveway and the walker would find themselves at an ornate gate near the main road. Turn left however and you’d be able to get to the weekend home of the UK’s prime minister. Previously owned by Lord Lee of Fareham, the 16th century Chequers manor house was donated to the nation in 1917 in order to provide a country retreat for the leader of the country. Somewhere where they could relax, unwind or even entertain should the need arise. A political disagreement between Lord Lee and the then Prime Minister Lloyd George almost ruined the handover but didn’t stop it finally happening in 1921, and successive Prime Ministers have been visiting the place ever since. Yet even the power of the number one politician of the country can’t stop the general public from legally entering at least part of the property, and many walkers use the legal right of way that crosses the driveway. As we walked over, I tried to imagine what would happen if we deviated off route and headed towards the house. Then I remembered Section 128 of the Serious Organised Crime and Police Act of 2005, and with visions of police armed with machine guns, I decided it was probably best to head to the small gate on the other side instead. 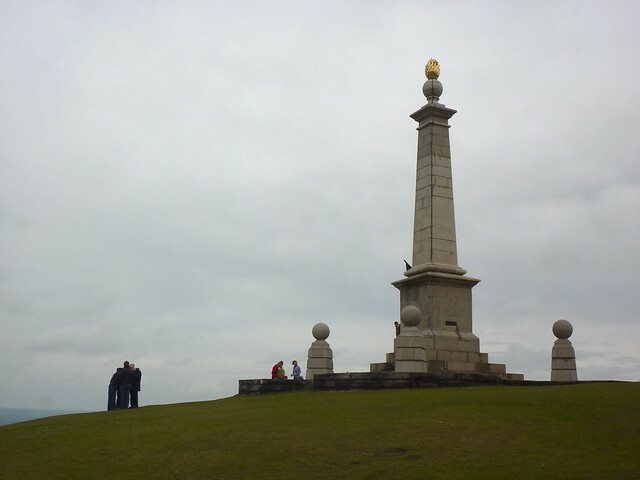 The gate would eventually lead us through woodland and up to the summit of Coombe Hill, home of a large stone memorial to the men of Buckinghamshire who died in South Africa during the Boer War. And from there it was just a gentle descent to the town of Wendover. From the copious quantities of banners and posters, there could be little doubt of the views of the local shopkeepers on the forthcoming High Speed 2 rail link, connecting London with Birmingham and beyond. Almost every local shop had a large poster in its window, providing a loud and visible message to David Cameron should he have decided to pop to the local Budgens for a pint of semi-skimmed. “I wonder if you were to own a shop and you put up a ‘pro HS2’ poster whether you’d suddenly lose all your trade and be treated like an outcast?” I mused. “Probably,” replied Catherine as we walked down the high street. As we sat on benches eating a slightly late lunch, Wendover’s market stalls began to pack away after a morning of trading; the man on the Ostrich meat stall telling a customer that he was packing it all in. All around the locals bustled with their Saturday chores and soon it was time for us to head on too. There was still six and a half miles before we could call it a day. 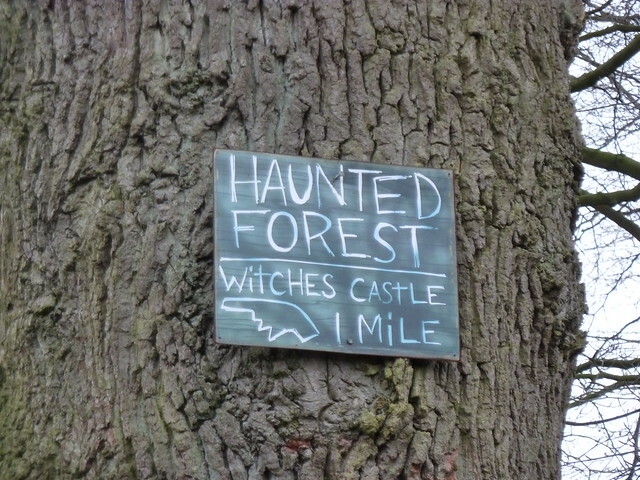 A series of lanes and woods led us on, passing through the tiny and quiet village of Hastoe where a sign told us we could find a haunted forest and a witches castle just a mile down the road. We found neither, instead walking through Tring Park and down an avenue of lime trees. Planted in the 19th century, the area was once owned by the powerful Rothschild family whose former mansion is now a school. The trees hide an obelisk and a summer house as well as another Rothschild addition: the glis-glis. A large doormouse of to 19cm in length, the creatures are normally found throughout western Europe but are resident in Tring only after an escape from the private collection of Lionel Walter Rothschild in 1902. Now an estimated 20,000 glis-glis, also known as the edible doormouse, live in the local area. The Rothschilds may be gone but their legacy lives on in more ways than one. The glis-glis were hiding as we headed on our way to the nearby Wigginton and the Greyhound Inn where we’d be staying the night and imbiding a few of their fine selection of ales and eating their scrumptious food. A pint of the Tring brewery’s Ridgeway seemed rather in order for reasons that no longer seem obvious, and the pub’s homemade pork pies and Scotch eggs also went down well as we loaded up with calories for the next day. Ivinghoe Beacon here we come! After a good nights sleep anyway. Next time the end is in sight as we arrive at Ivinghoe Beacon. First Published: 17 May 2012. Last Updated: 16 November 2014.